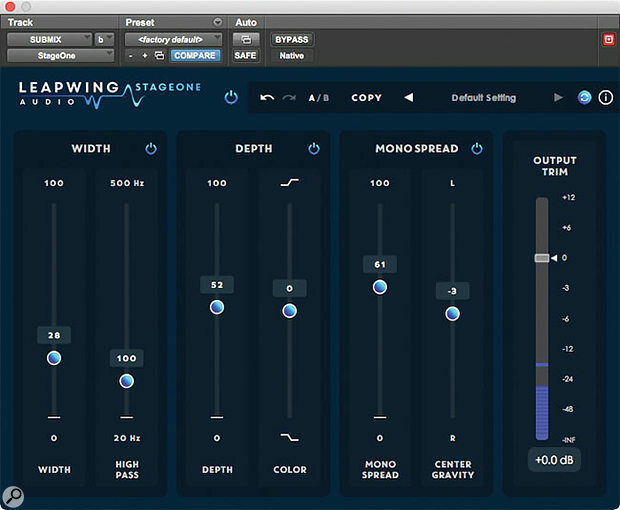 Leapwing Audio have produced a series of innovative plug-ins that appear to be prompted above all by demand from mastering engineers, but which have applications in mixing too. I recently reviewed their intriguing CenterOne v2 [SOS November 2018], which provides tools for mono extraction and stereo rebalancing; StageOne is also a plug-in designed to manipulate stereo imaging, but in a very different way. The basic concept seems to be to extract a signal that corresponds to what we hear as the 'phantom centre' and process this independently of the rest. Stage One contains three basic processing modules called Width, Depth and Mono Spread, each of which can be enabled or disabled independently. Width is perhaps the most conventional in terms of its application — it's a stereo widener — but the techniques it uses to achieve this goal are obviously a bit more sophisticated than the usual 'fling an M-S matrix on and ramp up the Sides level' approach. In essence, it appears to be boosting the level of the 'not phantom centre' component above a user-specified frequency threshold; this is not the same as boosting the Sides signal, and sounds quite different. Used in moderation, it's impressive, reasonably mono‑compatible, and has a solid feel to it that doesn't hollow out the mix or sound weird on headphones in the way that exaggerating the Sides can. That said, the available range is rather higher than I can imagine using in a mastering context, and high Width values introduce obvious pitch modulation into the signal. Next up is Depth, which adds early reflections that are "directionally optimised to create an enhanced sense of depth in the sound field". As you might guess, this is not a conventional reverb, and the only controls available are Depth and a Color slider, which manipulates the frequency balance of the added reflections. In use, it's quite a mysterious processor, and it can be hard to predict when it will be effective. I didn't like it on everything, but to my surprise, I loved it on a mix that had been recorded live and was already quite reverberant, where it seemed to glue everything together in a way that I hadn't realised needed doing. Finally, the Mono Spread module is more versatile than its name suggests. When fed a mono signal, it performs something that is conceptually akin to the old 'electronically reprocessed for stereo' trick that blighted so many albums in the late '60s — but which actually sounds remarkably good. That's progress, and the Mono Spread feature is equally at home with stereo sources too. Raising the Mono Spread slider increases the width of that 'phantom centre' component, but what's most useful is the Center Gravity control. This allows you to shift the apparent focal point of a stereo signal to the left or right, either to centralise an unbalanced stereo image or to push a stereo source to one side of a mix without making it mono. Mono Spread is probably my favourite of the three modules, and is capable of surprisingly transparent results, but all three of StageOne's, er, stages have the potential to be very useful in both corrective and enhancement roles. 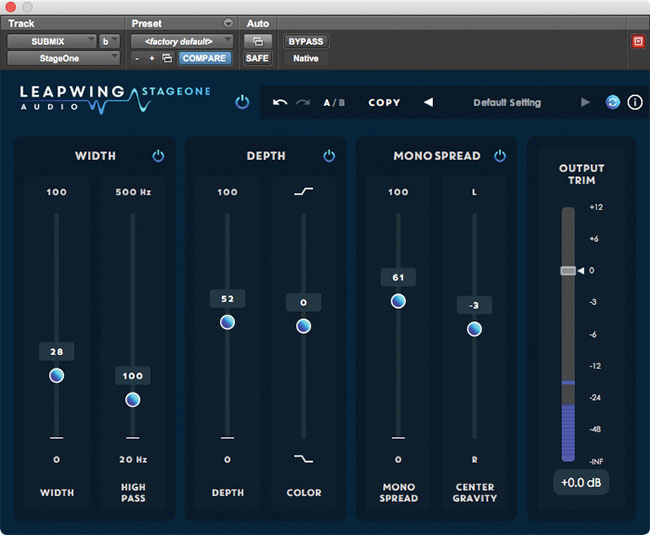 What this plug-in does might appear familiar, but the way that it does it definitely isn't!